ACI Motors started its journey on November 2007 with a goal of providing complete farm mechanization solution for the farmers. The business was initiated to reduce the cost of production; as well as reduce the drudgery of the farmers. Starting with Sonalika Tractor in 2007, ACI Motors is now the number 1 farm mechanization company in Bangladesh. Currently Sonalika is the number 1 tractor brand in Bangladesh, selling more than 3,000 units Tractor in a year which is directly benefiting farmers & entrepreneurs to increase their productivity. The business also expanded to other farm mechanization solutions like Power Tiller, Diesel Engine, and Water Pump. ACI Motors is the pioneer of modern agricultural solutions like Combine Harvester, Reaper, Rice Transplanter, and Drip Irrigation. Now 25% of total cultivable land in Bangladesh is cultivated through ACI Motors’ cultivation machineries. To popularize Farm mechanization solutions in Bangladesh, ACI Motors has developed self-financed credit scheme. ACI Motors is providing within 6 hours after sales service commitment anywhere in Bangladesh which is incomparable in this industry. Also ACI Motors has developed a professional team of 500 people working throughout the country to educate and communicate farm mechanization solution to farmers. The team is equipped with all mobility solutions like smartphone, motorcycle and tools to provide best possible after sales service experience. Also ACI Motors have introduced urban focused machineries like Construction Equipment and Yamaha Motorcycle. ACI Motors is trying to increase the speed of Bangladeshi people through its products and services offerings. On occasion of stepping in 12th years of Sonalika Tractor in Bangladesh, a daylong celebration program had been organized at “Simante Shammelon Kendro” at Rajshahi BGB Camp on 6th December 2018. The noteworthy segments were a friendly football match between Sonalika Tractor customers and well-wishers, honoring the customers who have thrived in business with the utilization of Sonalika Tractor and an enchanting cultural program. Twenty customers have purchased the Sonalika Tractor and they were handed over to them at the program premises. 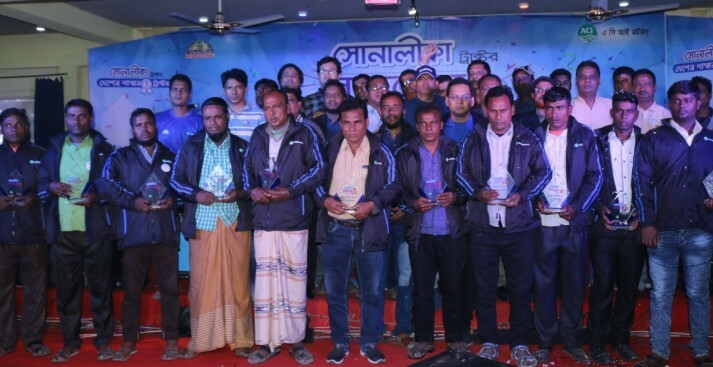 Around 400 Sonalika Tractor customers, well-wishers and higher officials of ACI Motors were presented at the celebration program.